The lead bidder for the National Broadband Plan (NBP) is preparing to 'fast-track' rural connections next year, the Irish Independent understands. The move would mean that the first of 540,000 rural homes and businesses under the State-sponsored scheme would get high-speed broadband in 2019, ahead of the expected 2020 rollout. A report cleared former communications minister Denis Naughten and David McCourt of improperly affecting the State tender process for the giant infrastructure project. However, the report by independent auditor Peter Smyth also found that Mr Naughten was correct to resign last month in order to insulate the process from "apparent bias". It now gives the Government the green light to conclude negotiations with the rural broadband consortium with a view to signing a contract in the next two months. The rollout across half-a-million rural homes is now set to begin, leading to the first connections late next year, according to several sources. Mr Naughten urged politicians on all sides to push ahead with the plan. He noted that the rules underpinning the NBP do not "expressly prohibit engagements" between bidders and the department. But as the Government insisted the NBP has been given a clean bill of health, Fianna Fáil was considering its next move. The party has already indicated the issue will form a major part of the ongoing confidence and supply negotiations. Its communications spokesman Timmy Dooley said the review has left "serious questions" unanswered. Mr Smyth’s report also said that while the project can go ahead, it is not possible to state “unequivocally” that the NBP was not discussed at private meetings. “Due to the limitations of the review process, in the absence of formal minutes or meeting notes for a number of meetings, I am reliant on statements of the former minister, Mr McCourt and other parties for verification of the purpose and contents of those meetings,” the report states. However, he concluded: “I am satisfied that neither the former minister nor Mr McCourt had the opportunity to influence the conduct of the tender process in favour of Granahan McCourt or otherwise. The Government maintains that it has been operating a ‘parallel process’ of assessment on the Granahan McCourt bid while the audit review has been taking place. The core of the plan is for fibre broadband lines to be physically laid in areas of the country that have never received proper internet services. However, up to 50,000 homes in the most remote areas might be provided with the latest wireless technology instead. New 5G cellular networks are not expected to be a factor, despite currently being switched on in cities. However, the existing rollout plan faces a technical challenge from Eir, with the State’s biggest operator refusing to grant access to its network at less than the conventional commercial rate. This had previously led to a row involving Granahan McCourt, Eir and officials in the Department of Communication. The issue was parked earlier this year but is set to be reignited once the contract is signed. Opposition parties have questioned how the rollout of high-speed broadband can proceed under the current plan. 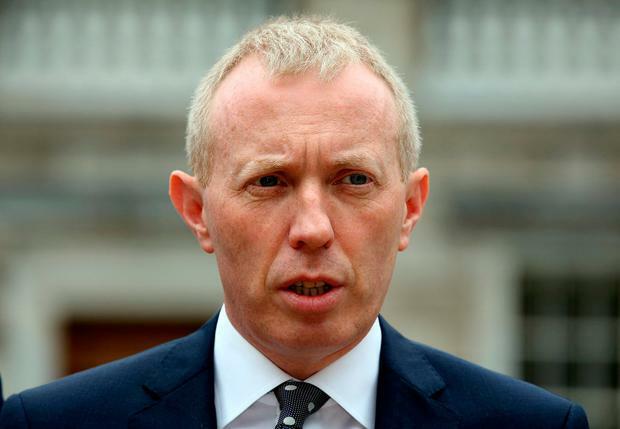 Fianna Fáil leader Micheál Martin described the level of contacts between Mr Naughten and the head of the Granahan McCourt consortium as “extraordinary by any yardstick”. The minister had 18 formal meetings, nine telephone calls and five dinners with David McCourt. “To me it’s a series on a level of engagement that’s without precedent in terms of a bidding process, in terms of a ministerial involvement with a lead bidder,” Mr Martin told the Dáil. Mr Dooley told the Irish Independent: “Long before the meetings emerged I believed the process had been jeopardised. The fact that so many bidders pulled out proved that. Mr Dooley indicated that he wants Mr Smyth to come before the Oireachtas Communications Committee to discuss “gaps” in the review. Labour Party leader Brendan Howlin claimed it would be “reckless” for the Government to proceed with the plan. However, Communications Minister Richard Bruton expressed a renewed confidence that the plan can be delivered. A spokesperson for the Taoiseach said he sees the report as “a partial or qualified vindication” of the position he took when details of the meetings first emerged.